AS the leaves turn in autumn, there are many shrubs with rich leaf colour at this time. The translucent berries of the Snowball Bush, Viburnum opulus. 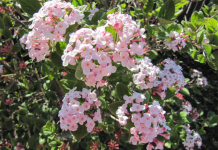 Starting with the viburnums, the first that comes to mind is Viburnum opulus “Sterile”, commonly known as the Snowball Bush due to its white pom-pom flowers. 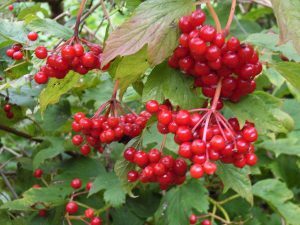 It is also known as the Guelder Rose (although no relation to roses) or European Cranberry, so take your pick. This is a native of Europe and North Africa, so has no problems with low water usage. In autumn, it has large bunches of translucent red berries that hang on long into winter. The rich tones of the autumn leaves are an added attraction. This is just one of many viburnums that are worth checking out. Cotinus coggygria, or Smoke Bush, features fluffy, smoky-blue inflorescence in late summer followed by reddening leaves in autumn. I recommend C.c. 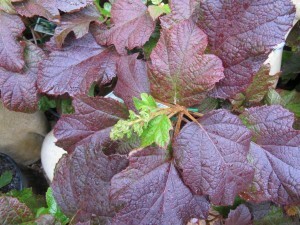 “Royal Purple” that, as the name suggests, has rich purple coloured leaves all summer. 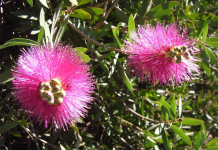 The plant was first introduced into western gardens in 1656. We know this as the early plant hunters kept meticulous records of where they first found the plants growing in the wild and the dates of discovery. The Oak Leafed Hydrangea on the turn in autumn. For a smaller shrub, there is the interesting Hydrangea quercifolia or Oak Leaf Hydrangea with its magnificent autumnal oak-leaf shaped leaves. It has white flowers most of the summer. 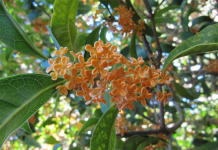 It was first found growing in the wild in the south-east of the US in 1803. Finally in this group of suggested autumn-leafed shrubs, Euonymous alata is a many branched shrub distinguished by its corky, winged bark similar to Liquidamber styraciflua, except the latter is a very large tree only suitable for the biggest garden. This euonymous is classed as one of the finest of all medium-sized shrubs for autumn colour. It was found in China in 1860. MOST garden advice columns will tell you to spray fruit trees with Bordeaux or Kocide mix in spring to prevent brown rot and curly leaf on the fruit. Usually this advice does not tell you that it is equally important in autumn. The time to spray stone fruit trees, ie peach, nectarine and plums, is once 75 per cent of the leaves have fallen. It is equally important to remove any fallen fruit from under trees or mummified fruit still hanging on the branches. The identical sprays are used at this time of the year. One important piece of advice is when pouring the spray into the sprayer, use a fine meshed funnel or an old nylon stocking. This will prevent fine particles of the powder clogging up the spray jet, which can be highly annoying. SOMETHING eating your veggies before you do? Plants looking off-colour rather than green? Problems deciding is it a weed or a goodie? If your local garden centre can’t solve your plant problems visit the CIT School of Horticulture Plant Clinic, at Bruce CIT in Charles Weston Lane, corner of Battye and Eade Streets. Questions can be answered as part of student training, with a back-up from teaching staff. It operates every Monday from 2pm-4pm during term times. Please put any nasties in a plastic bag and, for plant ID, if possible bring leaves, flowers and seeds. Contact 6207 4610. THE 23rd Apple Day Harvest Celebration will be held at Loriendale Orchard, 1.30pm-5pm, Saturday, April 6. Discover the best of organic heritage and modern apples, quinces and pears. Relax in the gardens with Devonshire teas and live music. Enjoy homemade, country-style apple pies, French crepes and Dutch pancakes at this Hall District Event. Loriendale Orchard is just past Hall village, taking the Spring Range Road to the right off the Barton Highway and right on to Carrington Road, watch for the signs. 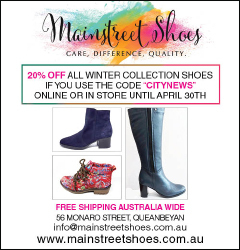 More information at loriendale.com.au or 6230 2557. Plant pennyroyal near a path so that it gets trodden on, wafting through the air with the delicious peppermint fragrance of the leaves. Sow snapdragon seeds now, sprinkled randomly. Freeze herbs after cutting back for later use. Give box hedging a last clip of the season and it will remain tidy until spring. Use apple corers to get rid of weeds in lawns. Wear gloves when handling hyacinth bulbs. The very fine hairs can cause a dermatitis-type rash.